Brand New 6BR/5BA Beach Home with Private Pool - Incredible! Great Beach Access, Designer Home! Welcome to one of Pensacola's finest new Beach Homes! This is a designer home with an open floor plan. It includes a commercial grade kitchen with bar seating, a large dining table, and a living room with leather couches which provide seating for many. This spacious living space is flooded with natural light and opens to a beautiful covered deck. Leaving the living room is a hallway leading to the master. This is a unique space with three built in twin sleeping areas. There is a full hall bathroom. The main floor bedroom is a master with a king bed and full bathroom. Additionally, the master bedroom has a modified master closet with three twin bunks built in, and there is an additional closet for storage as well as hanging space in the sleeping closet. The third floor bedrooms are described as follows: large bunk room with 2 queen beds and 4 bunk twin beds, a 3rd bedroom with a king size bed, full bathroom and private balcony. The 4th and 5th bedrooms both have king beds and share a Jack & Jill bathroom. Additionally, on the top floor as you come up to the stairwell landing, there are two twin bunk beds for extra sleeping. The upstairs alone sleeps 16 people and has great balcony access! Lastly, for the adventurous type there is a bonus loft room on ground level with queen size sleeping on an elevated platform. The outside of the house has a 70ft by 50ft event area with private pool and fire pit! This will be an awesome spot to hang out and host an event if that is your plan. There is also an outside shower, parking for at least 8 vehicles under the house, and covered access to the elevator that goes throughout the 3 levels! 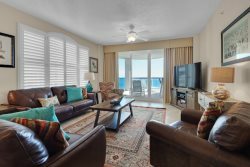 Be sure to book this new, deluxe, best of the best Pensacola Beach Home. Perfect for multiple families, weddings, events and even corporate outings. This will sell out quickly. This home brought to by the same management team that offers these exclusive listings, The Great Escape, 909 Ariola Drive, Beach Dreams, The Shore House. You will not be disappointed with the decision to make this your vacation destination. Please call with any questions. Team was great--responded immediately and cheerfully. The house is spacious and beautifully decorated; has a great pool; and is well located with easy access to the beach. My family enjoyed our time there and we'd be glad to stay there again. The only big drawback for my family was that the 6th bedroom is not what one expects and is not suitable for many couples/individuals.